1200 hours (12 Noon) Friday 21st June - see Travel andParking for further information on travel and parking arrangements. English Heritage has produced these Conditions of Entry to make sure that everyone can enjoy Summer Solstice at Stonehenge safety. If you contravene any of these conditions it may result in entry being refused or you being removed from Stonehenge. English Heritage reserves the right to refuse entry. Stonehenge is seen by many as a sacred site - please respect it and please respect each other. Drunken, disorderly, and anti-social behaviour will not be tolerated. It may result in you being ejected, possibly by the Police and not being allowed back onto the site. Only small amounts of alcohol for personal use will be permitted on to the site. Alcohol is limited to no more than the equivalent of four 500ml cans of beer/cider or 75cl of wine. No further alcohol will be permitted on subsequent re-entry. Be warned, drug/alcohol cocktails can be lethal, so please be fully of aware of what you are doing. Illegal drugs are as illegal at Stonehenge as they are anywhere else. The police will be on site during the access period and will take immediate action against anyone breaking the law. Summer Solstice is not a good time to experiment with drugs - the crowd, the noise and the sheer size of the place are likely to make any bad reaction much, much worse. As much of the access is at night, if you had a bad reaction it may be difficult to locate you to administer treatment. Stonehenge is a world renowned historic monument and it is seen by many who attend the access as a sacred site. Amplified music is inappropriate and will not be permitted. Camping, fires, Chinese lanterns, fireworks or BBQs are NOT permitted at Stonehenge, in the Solstice Car Park, or anywhere in the surrounding National Trust land. Please see Useful information for further details of local campsites. Do not climb or stand on any of the stones - this includes the stones that have fallen. This is in the interest of personal safety, the protection of this special site and respect for those attending. As well as putting the stones themselves at risk, climbing on them can damage the delicate lichens. In order to ensure personal safety, random searching may be undertaken, but we hope that self-policing and personal responsibility will prevail. Any items that might be used in an illegal or offensive manner will be confiscated. When thinking about what to bring with you, remember your personal possessions are your responsibility and you will have to carry them with you at all times. Therefore, travel as light as you can. Large bags or large rucksacks will not be allowed at the Monument although small bags and rucksacks (similar size to hand luggage on airlines) will be permitted. Think carefully about what valuables you normally carry and leave all non-essential items at home. 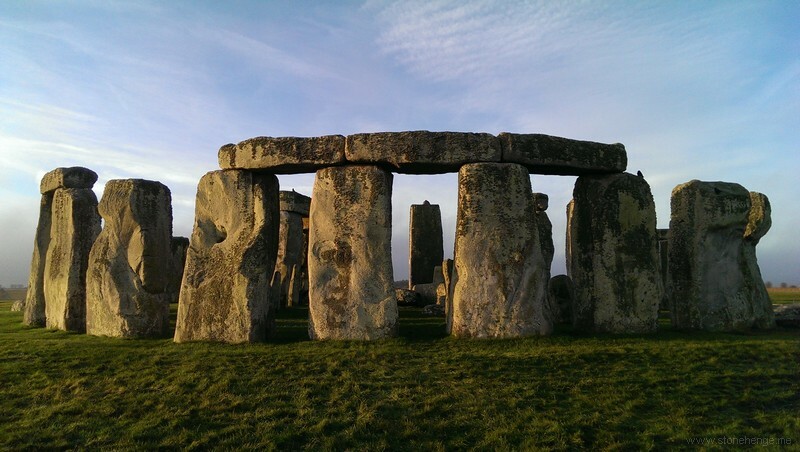 Whilst there is a lost property system, the nature of the access means that if you drop or mislay something in the Solstice Car Park or at Stonehenge it might not be easily found or handed in. If you are bringing your mobile phone with you please keep it safe. Think of the hassle you would have if you lost it, or it was stolen. Only small amounts of alcohol for personal use will be permitted on to site. Alcohol is limited to no more than the equivalent of four 500ml cans of beer/cider or 75cl of wine. No further alcohol will be permitted on subsequent re-entry. Be warned, drug/alcohol cocktails can be lethal, so please be fully of aware of what you are doing. As mentioned previously, no glass bottles are allowed on site at any time. In the interests of safety, sleeping bags or duvets will not be allowed on site. Sleeping on the ground can create a trip hazard especially as much of the access is during the hours of darkness. Also, people asleep on the ground could interfere with the work of the emergency services and hinder their ability to attend an incident. Small ground sheets and blankets will be permitted for people to sit on. If you do want to sleep during the access period, it is strongly recommended that you either return to your vehicle in the Solstice Car Park or go to one of the public gathering areas outside the Monument. Stonehenge is a world renowned historic monument and it is seen by many who attend Solstice as a sacred site. Amplified Music is inappropriate and will not be permitted at the Monument, in the surrounding landscape or Solstice Car Park, so please do not bring any sound systems or portable amplifiers. Acoustic instruments will be permitted. Make sure you wear and bring warm clothing with your, as despite the time of year, it can be very cold and damp at Stonehenge, particularly during the early hours of the morning.. If rain is likely, then bring a small umbrella for personal use. Please do not wear a hi-viz jacket as this can cause confusion with the officials undertaking a safety role. Close to the Monument, there will be several areas for people to gather, two of which will have braziers provided. Please use the areas for your own enjoyment, such as poetry readings, meditation or the playing of acoustic instruments. There are portaloos, including disabled toilets, in both the Monument Field and Solstice Car Park - please use them!! Do not desecrate the Monument or surrounding land. It's bad for the wildlife and makes the site dirtier for everyone, including you. Authorised catering points selling hot and cold refreshments, will be available throughout the access period and these will be clearly indicated. Please do not purchase refreshments from any unauthorised outlets. There is a tap for drinking water close to the Monument which will be clearly marked. However, there is no similar supply of drinking water available in the Solstice Car Park. The authorised catering units will be selling bottled drinking water as well as other hot and cold drinks. Parents and guardians are requested to ensure that children are not left unattended at any time. Children under 16 will be refused entry unless accompanied by an adult. There will be a marked information / meeting /welfare points, close to the entrance to the Monument. It will provide experienced, caring and confidential help for all kinds of practical and personal problems. 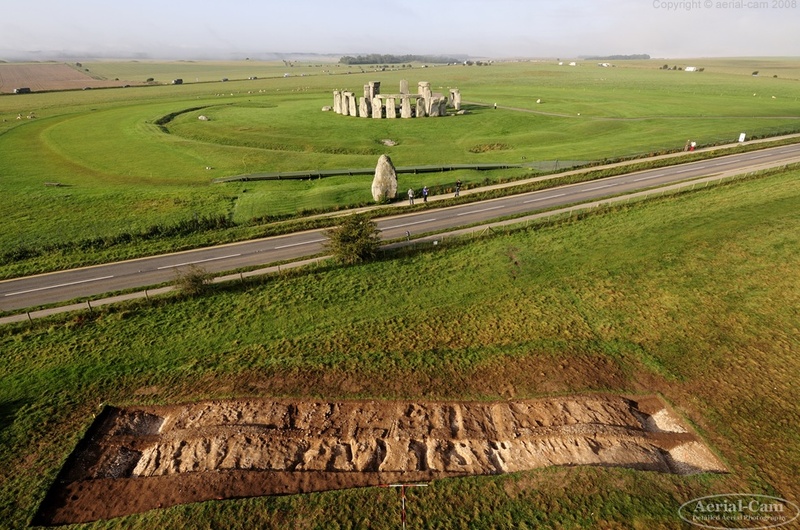 Visitors are requested to dispose of their rubbish carefully at the designated recycling and rubbish points located in the Solstice Car Park and at Stonehenge. Every effort is being made to create a more sustainable, environmentally friendly Solstice. To help with the recycling process, clear bags will be handed out on arrival and after sunrise. Please do not drop litter - bag and bin your rubbish so the recycling team can collect it. You are visiting a very sensitive landscape which is still in agricultural use - please respect the local farmers' crops and livestock. All visitors are encouraged to 'think green' and improve on the already successful waste management programme. We aim to reduce the amount of rubbish that goes to land fill and increase the amount that is recycled. So please help us to make this year a cleaner Summer Solstice. The Solstice Car Park will be lit and there will be ambient lighting at the Monument throughout the night. These lights will be systematically turned off as dawn approaches but only when it is operationally safe to do so. Please do not tamper with any of the lighting towers - it can be dangerous. There will be stewards on duty to help with the smooth and successful running of the Solstice access. They are also there to answer your questions, so please don't hesitate to approach them, they are there to help. If you notice anything that concerns you please report it, so that appropriate action can be taken. The Great Western Ambulance Service NHS Trust, St John Ambulance Service and Wiltshire Police will be in attendance. If you, or someone you are with, needs medical attention, please seek help from one of the security staff or stewards on duty. In the unlikely event of an incident that requires the evacuation of Stonehenge or the Solstice Car Park, we would ask that members of the public respond quickly to instructions given by stewarding staff, the Police or other Emergency Service personnel. PA announcements for your safety and information may be necessary during the access period. If you get lost, or lose track of your friends or children, don't panic. Locate a member of the security or stewarding team. Alternatively go to the information / meeting / welfare point and report the situation to the welfare team. No unlicensed, non-invited traders will be permitted access. This applies to the Monument area, the surrounding landscape and Solstice Car Park. English Heritage will do everything it can to make your visit a safe and enjoyable experience. However, English Heritage accepts no liability for any injury to persons or loss of, or damage to, property arising in any way whatsoever whilst at Stonehenge or the Solstice Car Park, and entry is at people's own risk. Although stewards and security will be present at both Stonehenge and the Solstice Car Park, please note that any people entering these areas do so at their own risk. For further information about the Summer Solstice at Stonehenge, please telephone English Heritage Customer Services Solstice Information Hotline on 0870 333 1186. 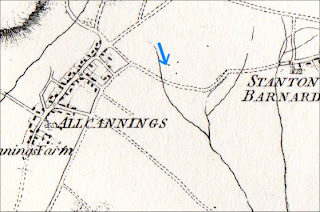 Just south of Rybury Camp and All Cannings Cross there is a spring that is a source of the Hampshire River Avon. 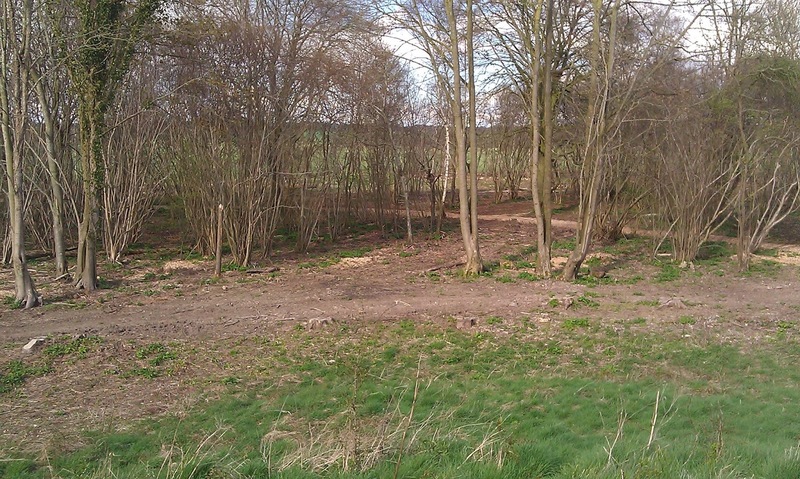 It is now piped and the original marshy spot infilled. The water then goes under the Kennet and Avon canal in a pipe, or drock as the old wiltshiremen called them. 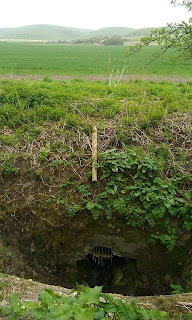 It is then piped across the fields and alongside the lane to the stream to the west of All Cannings. 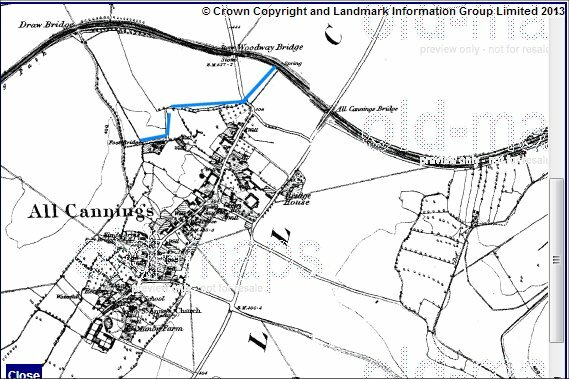 But old maps show it used to flow to the east before the canal and other modern improvements to the landscape. 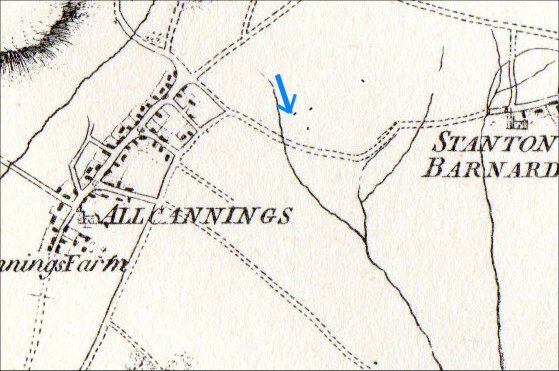 I wonder what could be found at the original springhead as it has been protected underground from the plough for many years. 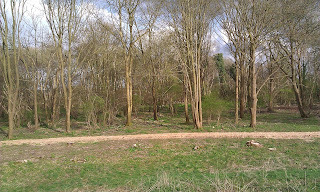 Driving past Fargo Plantation I noticed the National Trust had taken down the no entry signs that they had erected as they cleared the wood of undergrowth and put in paths and access gates. Somewhere I have seen the claim that Stonehenge was visible from the top of the Monarch of the Plain barrow. 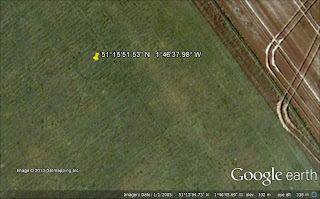 According to the profile of the map it seemed probable but I thought it worthwhile exploring. The view towards Stonehenge from the top of the Monarch of the Plain. On the afternoon I was there cloud and bright sunlight patches highlighted features in the distance, but I only had my camera phone with me and so I couldn't capture details. But if you click the picture to enbiggen it in the centre there is a white dot which is a van on the road,, just above it are the pale shapes of some of the stones of Stonehenge. Not a very convincing photo but I'm sure I saw them, we will have to wait until the winter and for the leaves to fall to check. 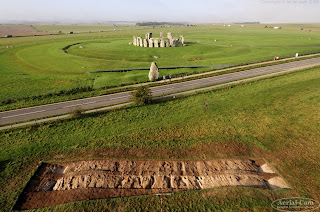 Henry Rothwell on Digital Digging has been playing with the latest version of Google Earth and has come up with some stunning pictures of the Stonehenge and Durrington Avenues at Solstice time showing the alignment of the Milky Way: Click for larger. Henry says: This is really just a conversation starter. I find it hard to believe that people so fond of linear geological features that align with the sunrise and sunset on the day of the summer solstice could have missed this very, very obvious coincidental phenomenon. Almost as hard to believe that no-one has spotted it until now. Which is why I’m prepared to be wrong. Please download the files (see below), play with them, see what you think. 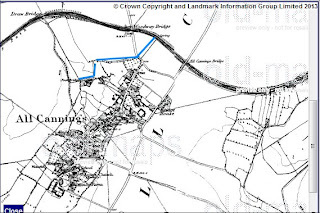 The Stonehenge Avenue file is here, and the Durrington Walls Avenue file is here. Don’t forget you’ll need the latest version of Google Earth to run the experiment. My friend Simon Banton comments: "This is one case (perhaps the only one) where precession of the equinoxes affects the proposed alignment - 4,500 years ago this wouldn't work." and gives us this reconstruction. It is beyond my understanding of astronomy but my huge thanks to both for this and especially to Henry for making the files available. 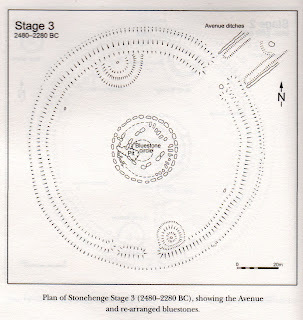 He pieces together evidence about it from excavations by Atkinson, Hawley and Gowland and concludes it dates to 2440-2100 BC, after the Great Trilithon was erected and that it was filled back up in prehistory because a bluestone was set into it as part of the inner oval of bluestones. 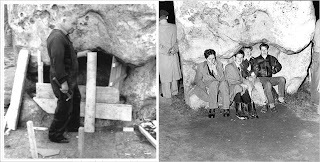 Atkinson thought it was the ramp for the erection of Stone 56 - photos below - but MPP shows it wasn't. The dark area of the ramp can be seen on the side of the excavation leading down towards the base of 56 but it is too shallow to be of use and doesn't join up to Gowland's excavation around the base of 56. MPP declares the purpose of this huge pit, estimated as 12 metres long, 5 metres wide and 2.4 metres wide to be a "complete mystery". The size is very approximate as edges haven't been found. Let me indulge in proposing a hypothesis of what the pit might have been for. I think it fits all the scant evidence but that any further proof is unlikely to be possible. Any number of stones could be the candidate for having being in this central position but my hypothesis is that it was the Lake House Meteorite . Follow the link for more information but we know this 92.75kg stone landed about 30,000 years ago, no crater has been found so it may have been onto the Ice Age ice at that time, and may not have been anywhere near Stonehenge. About 10,000 years ago it was exposed to the elements and started weathering. About 4000 years ago it was buried in the local chalk before being dug up in probably Victorian times by amateur barrow diggers. The fantasy history runs that this strange stone was brought to Stonehenge very early on, it was buried in the holiest central position in recognition of its unique qualities. A generation or so later it was decreed that some leader's tomb, or other place was more fitting for it and so like the Stone of Scone it was moved to please the leader. This involved excavating the pit to find and remove it. 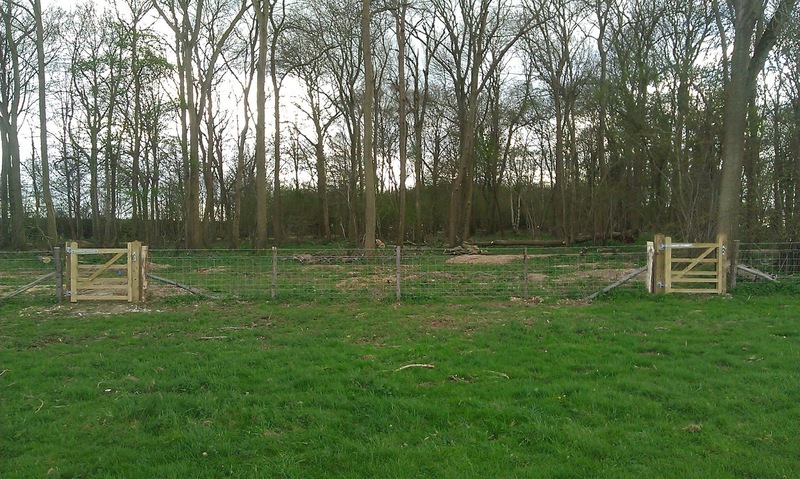 The pit was then filled in and the bluestone horseshoe erected. Our Victorian diggers then found it in its secondary burial place in a barrow. Human beings were occupying Stonehenge thousands of years earlier than previously thought, according to archaeologists. Research at a site about a mile from the Wiltshire landmark has found evidence of a settlement dating back to 7500BC, 5,000 years earlier than previous findings confirmed. Carbon-dating of material at the site has revealed continuous occupation of the area between 7500BC and 4700BC, it is set to be revealed on BBC One's The Flying Archaeologist on Friday night. Experts suggested the team conducting the research had found the community that constructed the first monument at Stonehenge, large wooden posts erected in the Mesolithic period between 8500 and 7000BC. Open University archaeologist David Jacques and friends started to survey the previously unlooked-at area around a mile from the main monument at Stonehenge when they were still students in 1999. 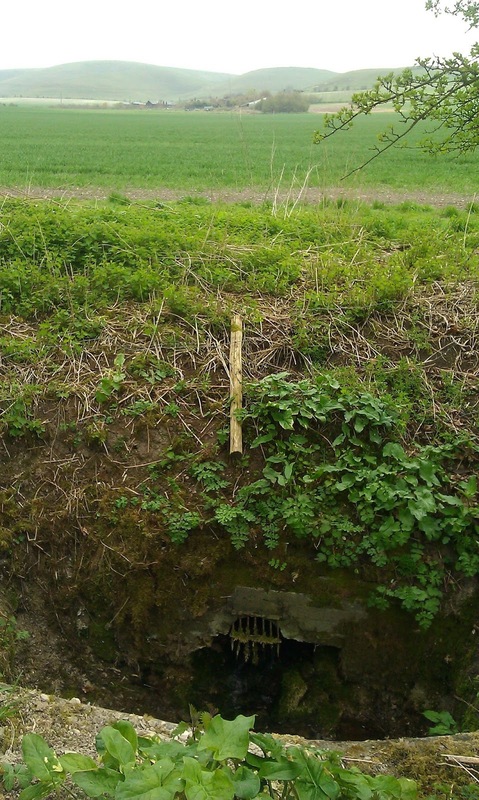 The site contained a spring, leading him to work on the theory that it could have been a water supply for early man. He said: "In this landscape you can see why archaeologists and antiquarians over the last 200 years had basically honed in on the monument, there is so much to look at and explore. "I suppose what my team did, which is a slightly fresher version of that, was look at natural places - so where are there places in the landscape where you would imagine animals might have gone to, to have a drink. "My thinking is where you find wild animals, you tend to find people, certainly hunter-gatherer groups, coming afterwards. 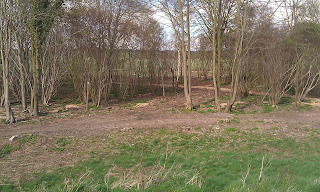 What we found was the nearest secure watering hole for animals and people, a type of all year round fresh water source". Dr Josh Pollard, from Southampton University and the Stonehenge Riverside Project, said he thought the team may have just hit the tip of the iceberg in terms of Mesolithic activity focused on the River Avon around Amesbury. 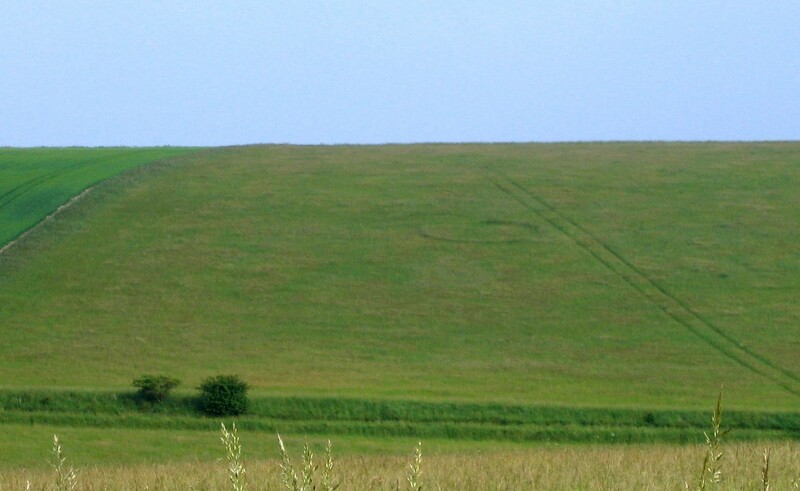 "The significance of David's work lies in finding substantial evidence of Mesolithic settlement in the Stonehenge landscape - previously largely lacking apart from the enigmatic posts - and being able to demonstrate that there were repeated visits to this area from the 9th to the 5th millennia BC," Dr Pollard added. 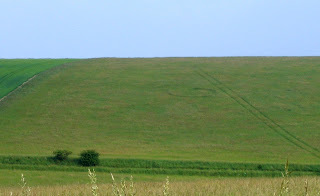 It looks very much like a circle I spotted around 2004 on the North facing valley side of Water Lane running East onto the plain from Enford. 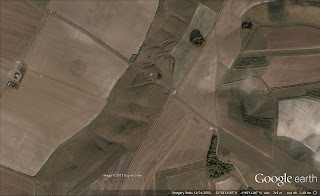 This was visible for years both on google earth and from the opposite side of the valley, now not visible which I put down to the exceptionally wet period from last summer onwards countering the crop mark effect seen in dryer conditions. 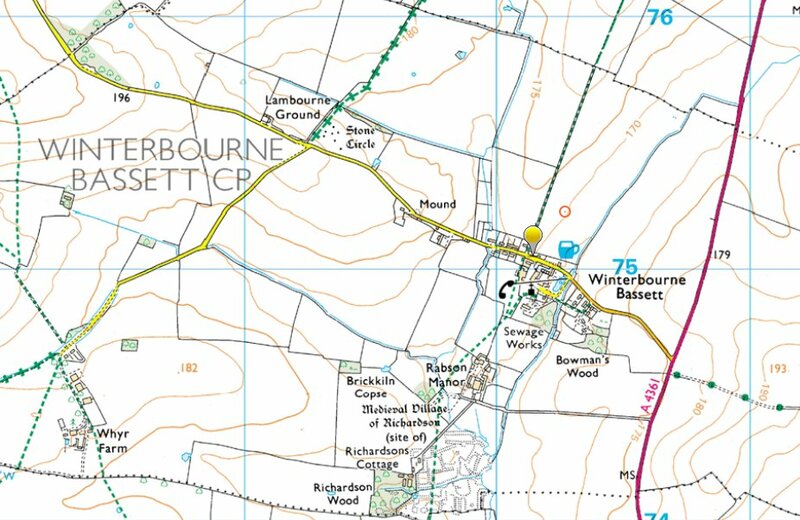 The tanks have been going round the hillside and there are fungus rings too complicating matters but this seemed different.I assumed the Water Lane circle to be a ring ditch from a barrow there are known barrows down the valley towards Enford. Definitely not crop circles this time. Brian John brings Colin Pillinger's Royal Society lecture on the Lake House Meteorite to my attention. The lecture is recorded and the slides available. "For as long as anyone could remember, a large rusty bolder sat close to the front door of Lake House, an impressive Elizabethan mansion located in the village of Lake near Salisbury. 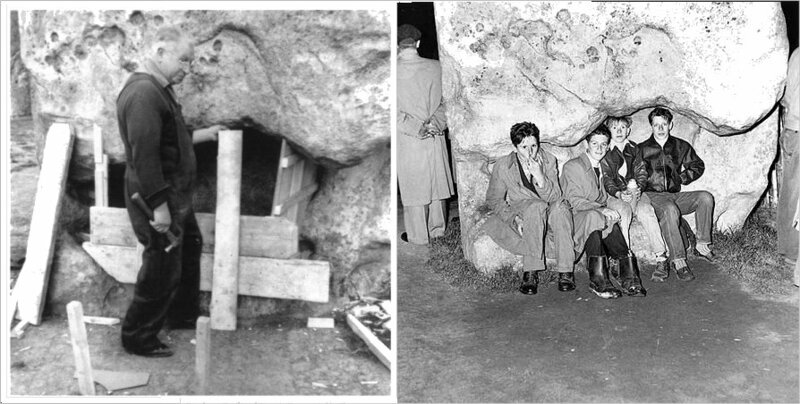 It was a long held tradition that the rock was a meteorite, but no one could be certain. Then, in the early 1990s, the owners of the house contacted scientists at the Natural History Museum in London, who were able to confirm that the rock really was a meteorite. It was subsequently transferred to a storage facility, where it languished until a few years ago, when Professor Colin Pillinger decided to investigate things further." The meteorite had a weathering age of 10,000 yrs BP but is thought to have fallen about 30,000 years onto ice or perma-frost. No crater has ever been identified. It has local chalk adhering to it, most of which has washed of in the last century of it guarding the steps of Lake House. 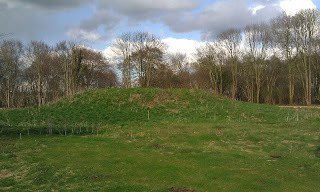 It is assumed it was dug from a nearby barrow by a gentleman digger in the nineteenth century. 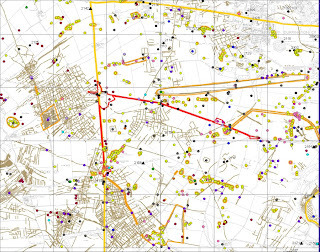 Every old thing you could want to know about the Stonehenge area available to download. 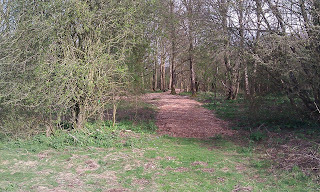 Mystery Circle at Winterbourne Bassett - Any Ideas? 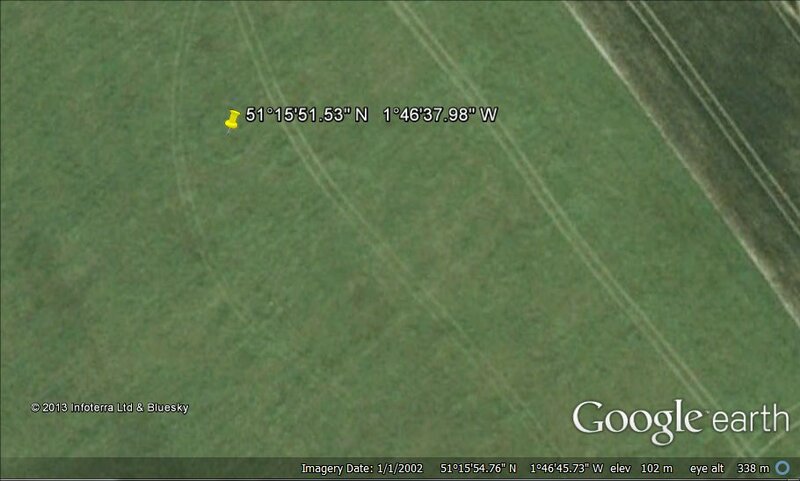 Looking at Google Earth I found this circular mark in a field near Winterbourne Bassett in 2003, and I think I can just see traces of it on the 2006 photograph as well. Pastscape doesn't seem to have anything marked here, so I thought it might be the shadow left after a crop circle. 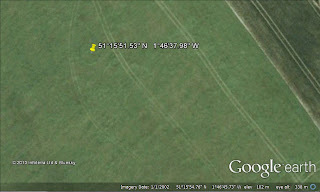 But looking at 2002 and 2003 crop circle photographs, ie http://www.temporarytemples.co.uk/imagelibrary/2003.html , nothing seems to come close. There is one in 2009 in the same field - http://www.flickr.com/photos/richard_bradshaw/3816697405/ which is obviously too late for this. Here is the interactive Google map locating it. Spring brings the Jackdaws' nest building to Stonehenge. One of the favoured holes is the natural chimney in Stone 60. The two holes arrowed in the picture below (click to embiggen) are connected by a natural winding passageway inside the stone. 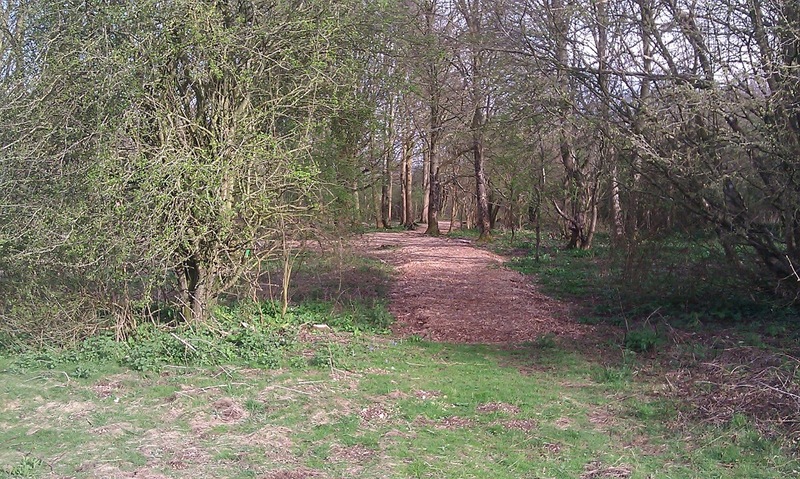 As this is very visible from the public path it is easy for visitors to see. 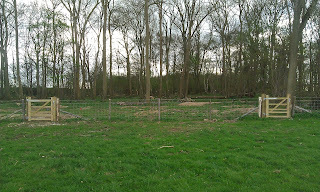 The Jackdaws need to block the hole with twigs to build their nests. Yesterday some twigs they were dropping in from the top were still falling right through, but they are close to succeeding. It is worth pointing out yet again that the concrete infill at the bottom of the stone does not extend up into the stone. 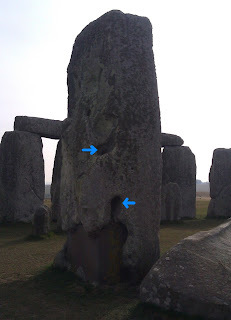 It was a simple C shaped cavity that was strengthened in 1959 when the stone was straightened up; there is a hairline crack on the north side of the stone which was thought to presage a collapse. 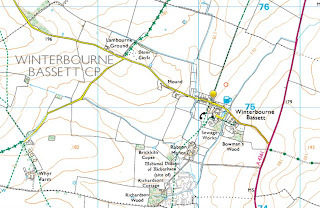 An OS map shows a Stone Circle to the north-west of Winterbourne Bassett, which is just north of Avebury. Click any picture to enlarge it. 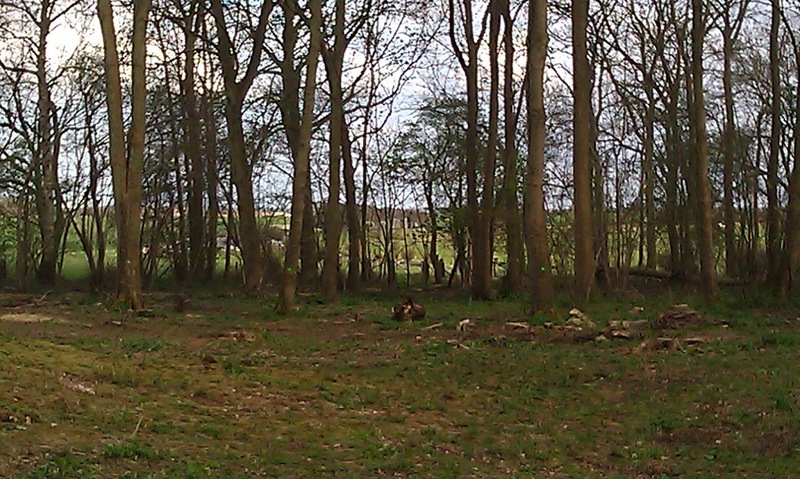 The remains of a Neolithic stone circle. 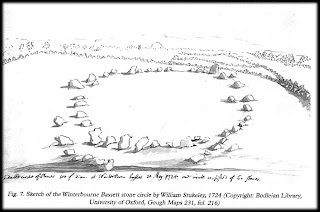 It formerly consisted of a double concentric row of stones, the outer circle being 234 ft, and the inner being 148 ft in diameter, with a single stone in the centre. 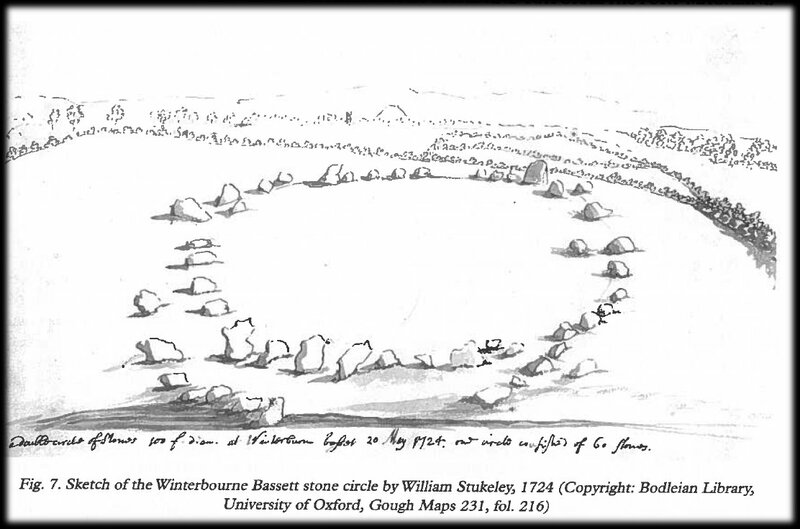 Many of the stones had been removed by Stukeley's time but he describes a "single, broad, flat, and high stone, standing by itself" to the west of the circle. Smith uncovered a number of stones in 1881-2 and produced a plan. 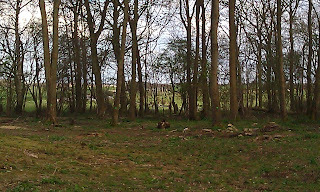 Nearly all the stones are now destroyed or almost overgrown. Which reveals a surprising result of the investigation they did into the circle. 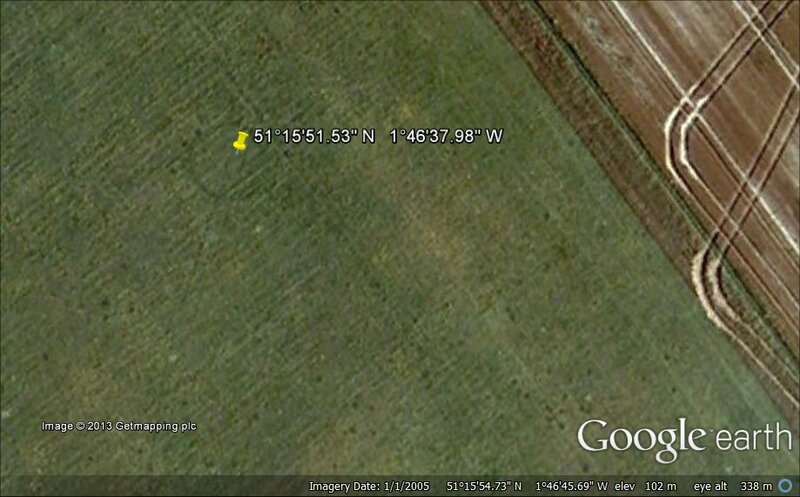 They don't think it is where it is marked, they think the stones there are probably a natural scatter of sarsens. You will note that it shows Avebury Church, Silbury Hill and the outline of the Marlborough Downs in the background. The two highest points are Milk Hill and Tan Hill. 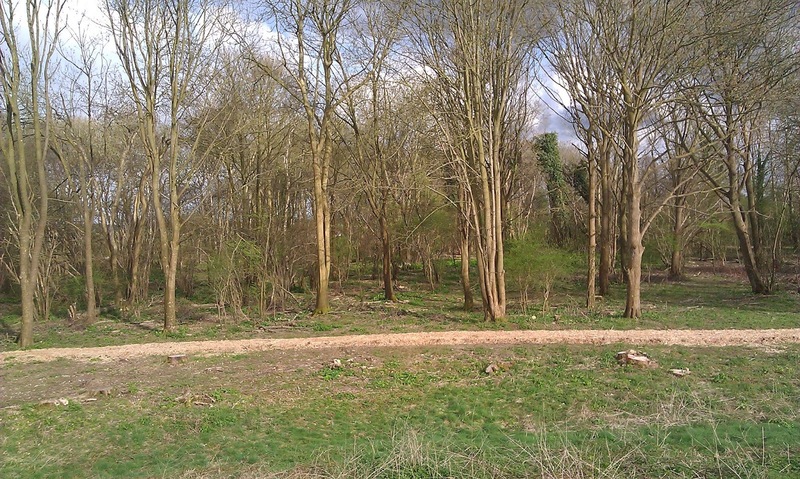 These are to the south and the recorded site faces north. They aren't visible from it. But there is a field the other (southern) side of the road from where they can be seen. If we look to the south we can see the shape of the Downs matches Stukeley's drawing. 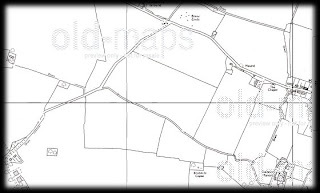 An old map, from http://www.old-maps.co.uk/maps.html?txtXCoord=409380&txtYCoord=175500 shows that the field boundaries to the south match the hedges in the drawing. Unlike today, which can cause confusion. 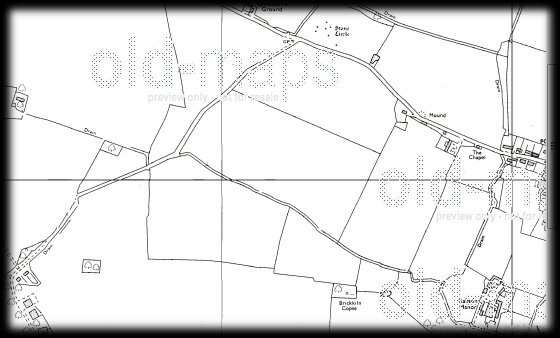 Using the maps we can draw a line from the top of Milk Hill over Silbury Hill and arrive at this field, and Avebury Church would be to the left or east of this line of site, just as in Stukeleys drawing. 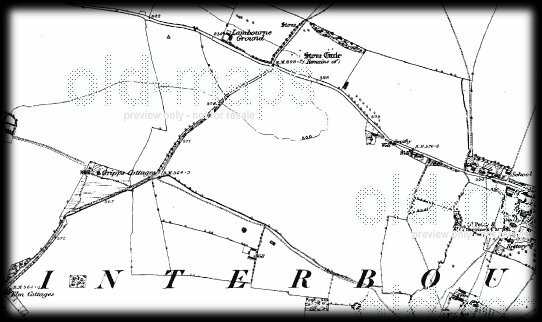 It all leads to confirming the paper's conclusion, the stone circle was to the south of the road and has completely disappeared. You will have to read the rest of the paper to find further evidence but this simple desk-based exercise shows how we can discover the site of a stone circle without going out in the cold..
One of the stone sockets found in the southern field - photo by Pete Glastonbury. 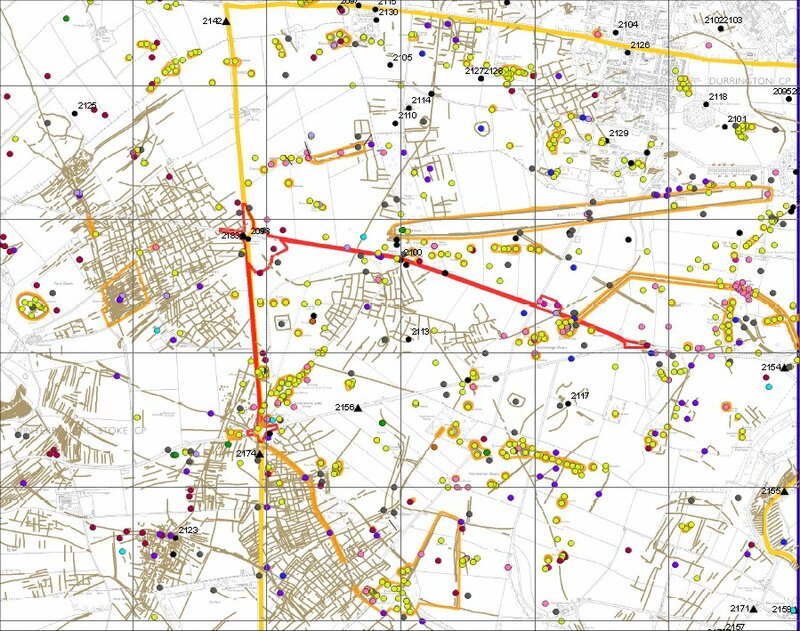 Brian John has put together two interesting posts about Periglacial Stripes, especially with regards to those under the Stonehenge Avenue. 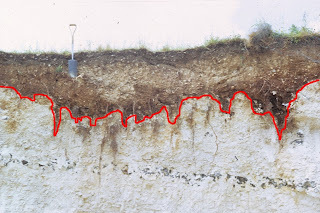 His main point is that periglacial and other grooves are common on the top of chalk. A close-up of coombe soils and the underlying chalk on Salisbury Plain. Again the junction is highly irregular. Note the band of flint nodules lower down. 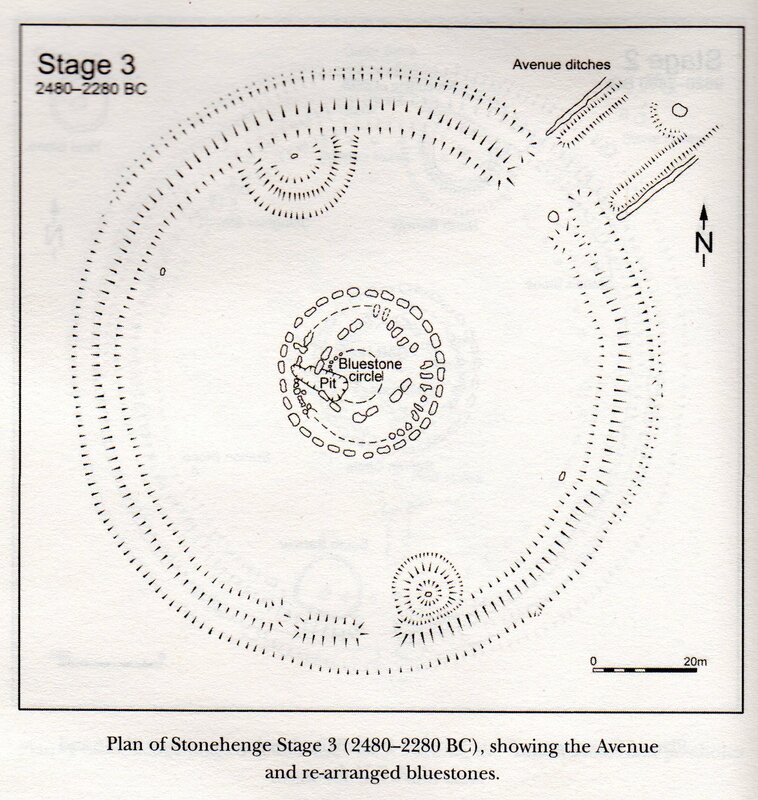 The unanswered question is how unique and unusual were the ones under the Avenue and were they enough to be the reason for Stonehenge to be built where it is. A new warning sign appeared yesterday at Stonehenge - click to read. 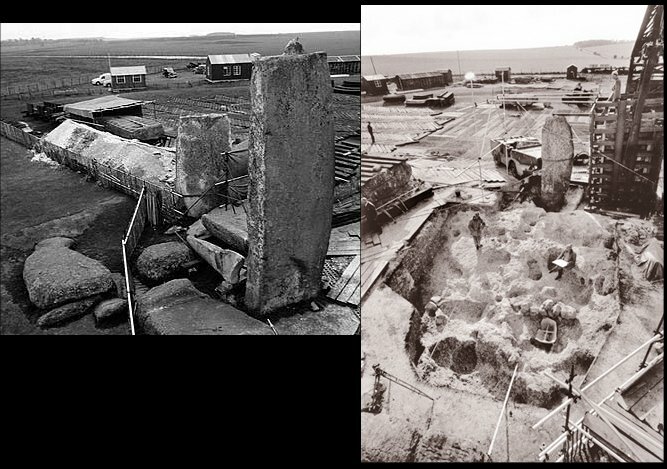 The truth about what lies under Stonehenge, or something to do with the date?